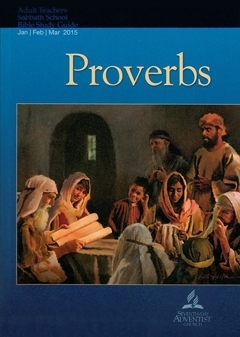 Some of this week’s proverbs show parallels with Egyptian texts. Under inspiration, Solomon might have shaped these texts according to a specifically Hebrew perspective. Here, the words of the Egyptians meet the Spirit of Israel’s God; and thus, they became divine revelation. This is not how divine inspiration works. In promoting such a practice, this teaching validates the writings of Ellen White, which were often taken from other works, plagiarized by her. Scripture has never been borrowed from another religion and “shaped these texts to a specifically Hebrew perspective.” The words of the Egyptians do not meet the Spirit of Israel’s God and become divine revelation. God’s revelation through Solomon was direct inspiration, not borrowed and modified “truths” from somewhere else. This observation is important, for it reminds us of the universal character of “truth.” What is true for the Israelite should also be true for the Egyptian; otherwise, it would not be the truth. God’s truth never comes from other religious sources, but only from the Bible as men were moved and wrote what God inspired them to write. Egyptian “truth” is far different than Biblical truth. They have a pantheon of Gods and Goddesses, we know there is only one God. They have beliefs about the afterlife that differ significantly from Christianity or Judaism. Just because another faith has statements that are close to the Biblical statements, and can be refined by a human author (in this case Solomon) does not mean that what they have is truth. Egyptian religion and practice come from one source, the enemy of our souls, Satan. We must never forget that in his deceptions our arch-enemy mixes in a little truth with falsehood to make it sound as though it came from God. We must avoid any thinking that God’s truths come to us as modified “truths” from other religious sources. Some people who have a lot of biblical facts in their heads have no real knowledge or experience with the Truth (John 14:6). Think about all the powerfully logical reasons we have for our Seventh-day Adventist faith. What are these reasons, and why should we never hesitate in keeping them ever before us and sharing them with others? Bring your answer to class on Sabbath. Today’s lesson is about robbing from the poor. The lesson author makes some true statements about the injustice done to the poor, using David and Bathsheba as an example. Those who remain unrepentant about their injustice will have to answer for it before the Lord of the universe. Psalm 51 is David’s psalm about his mistreatment of Bathsheba and her husband. He truly repented. The lesson author does not even mention repentance, but only judgment for those who have practiced injustice. Those who practice injustice towards the poor need the gospel preached to them just as much as the poor need the gospel. They need to know that there is forgiveness for what they have done, if they repent and accept God’s forgiveness. How should faith in God and in His promises of judgment help to give us some peace of mind regarding all the injustice we see in the world now? Apparently God’s love does not abide in such a person. We should each search our own souls and bring justice to those we have been unjust to in the past. Today’s lesson teaches us to look beyond the immediate gain from certain sins to the long-term results of not committing those sins. We should hate sin because it is sin. We should hate it because of what it has done to us, to our world, and to our Lord. If we want to see the real cost of sin, look at Jesus on the cross. This is what our sin has cost. That realization alone should be enough (though so often it isn’t) to make us want to avoid sin and to keep away as much as possible from those who would lead us into it. If we confess our sins [sinfulness], he is faithful and just to forgive us our sins and to cleanse us from all unrighteousness. We don’t have to remember every single sin we’ve committed to receive this forgiveness. Confessing our sinfulness allows the blood of Christ to keep on cleansing us from all unrighteousness. The lesson today clearly misses the fact that in the New Covenant, eating and drinking are not a part of our spiritual lives. In fact, we are warned in 1 Timothy 4:1-4 that teaching about eating and not eating is a lie from the enemy of our souls. Whether we eat or don’t eat, drink or don’t drink, we should all be doing these things to the glory of the Lord and not just for the sake of man. Good dietary habits are a good thing to follow, but these things should never become a part of our religious institutions. As seen above, teaching about requiring abstinence from foods God created, is a doctrine of demons. The fact that Adam and Eve’s only commandment had to do with food is simply incidental to the story being told. We should not make something more out of that than the Bible states. The law of Moses clearly warns that those who fail to report what they witness will bear guilt (Lev. 5:1). We may not be able to act against crime, but if we keep silent about what we see, we then share the guilt with the criminal. By our silence, we become accomplices. He answered, "Every plant that my heavenly Father has not planted will be rooted up. 14 Let them alone; they are blind guides. And if the blind lead the blind, both will fall into a pit." This is Jesus’ warning about the Pharisees. He explicitly states that we should “let them alone”. We should report their crimes to the appropriate authorities, when necessary. This does not mean that we do not care for our neighbors. Christians should be the best neighbor to have in the neighborhood. Murder is one evil that we may not be able to make an impact on in the lives of others. Murders happen every day all over the world, but we can only influence those around us. Injustice, economic oppression and war will always be with us. We can only take care of those in our sphere of influence. We can fight hunger and racism for the sake of our neighbors, but we cannot be held responsible for all oppression everywhere, our responsibilities lie within our sphere of influence. Our responsibility is to live good Christian lives and be salt and light in a dark and dangerous world. We are to love all, especially the “brethren” (fellow believers). This is a witness to those around us of what a relationship with Christ can bring. Today’s lesson, as is so often the case, is a quote from Ellen White. There are two things to notice about the quote. First, she states that “Not a moment we have to lose.” Ellen White elsewhere states that we will be judged about wasted moments, and time spent doing things other than witnessing about the Adventist faith. If there are wasted moments in our lives, we will not be judged for them. Christ’s forgiveness even redeems wasted moments and will use what we do to spread the gospel message. Again, we can only be responsible for our opportunities and pray when we miss the opportunity to share the gospel with another. Sometimes, what we do and how we live as Christians makes the most impactful witness for Christ. Ellen White says something in this reading that warrants our attention. She says, “We want something besides Sabbath religion.” She hit the nail on the head with that statement. Too much emphasis is placed on Sabbath-keeping, and what is right or wrong to do on the Sabbath day. Christians must move beyond the petty aspects of their religion and start eating the meat of the gospel. In fact, each Seventh-day Adventist needs to move beyond the Sabbath to the more important matters of the Kingdom of God; including things such as righteousness, the cleansing of our sins by the blood of the Lamb, and personal devotional time with the Lord. Although the reading is short and there are many good points that are made, how do we know of Ellen White’s source for the teaching. She plagiarized much of what she wrote, and that often includes the positive statements made by her. After you have read the Ellen White statements, I would suggest one to read First Corinthians chapter 3, Galatians, Romans chapter 8, and or Hebrews. Spending time in the infallible, inerrant word of God should be a Christians priority for truth and grace through the Holy Spirit as one reads the Word. Copyright 2015 BibleStudiesForAdventists.com. All rights reserved. Revised January 27, 2015. This website is published by Life Assurance Ministries, Camp Verde, Arizona, USA, the publisher of Proclamation! Magazine. Contact email: BibleStudiesForAdventists@gmail.com.